Niagara University students were treated to a career panel discussion featuring Ingram Micro employees, from left, Rebecca Petrie, ’09, MBA’11, Jeff Streb, Hub Wagoner, ’91, and Tom Bamrick. Representatives from Ingram Micro, the world’s largest wholesale technology distributor, spent time on campus Monday afternoon to offer students advice on how to enter the job market and, upon doing so, advance their careers. Each of the professionals shared perspectives on how their educational experiences positioned them for success with the global Fortune 500 that employs more than 1,600 people locally. 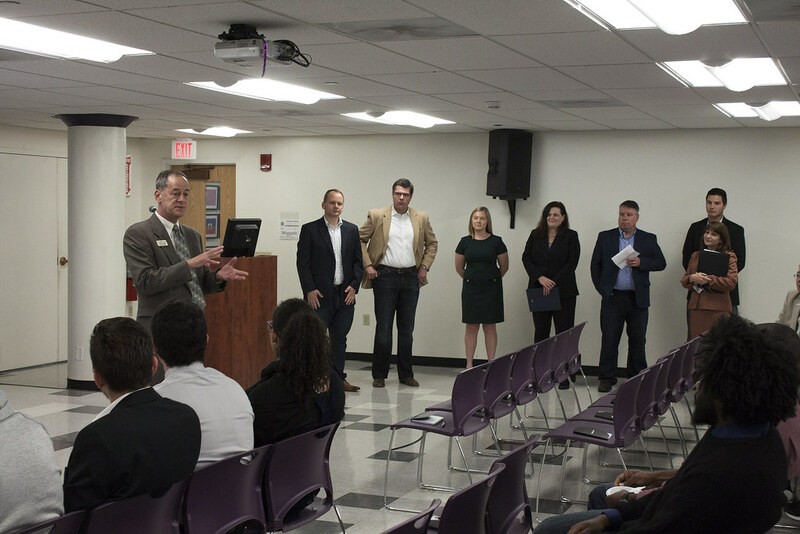 Tom Bamrick, Ingram Micro’s director of global vendor engagement, suggested to the students that they take advantage of the plentiful opportunities offered by Niagara University’s Office of Career Services, which co-sponsored the event with the College of Business Administration. Dr. Lisa Williams, associate professor of management, moderated a panel discussion that featured four individuals at different points in their career trajectories: Bamrick; Rebecca Petrie, ’09, MBA’11, business analyst; Hub Wagoner, ’91, senior vendor business manager; and Jeff Streb, senior director of human resources learning and development. Bamrick told the audience of about 50 that, over the course of his 23-year career at Ingram Micro, he’s come to appreciate the extraordinary value of mentorship. To learn more about Niagara University’s Office of Career Services, please visit www.niagara.edu/career. Additional information on NU’s business programs is available at www.niagara.edu/business.